Minister for Transport, Tourism & Sport Leo Varadkar is this week promoting Ireland as a tourism destination at one of the world’s most important tourism conferences in China. The Minister is addressing the opening of the Global Summit of the World Travel and Tourism Council (WTTC) in Sanya, China along with a range of leading figures in the global travel and tourism industry. He is also undertaking promotional work in Shanghai and Beijing, supporting the Irish aviation sector, and meeting the diaspora and the GAA. This is the first time in many years that Ireland has been able to present its own tourism industry as a success story on the world stage at such a significant tourism conference. But the trip is also designed to promote Ireland as a tourism destination, and to encourage airlines to consider launching new routes into Ireland. “This invitation to take part in the WTTC this year is a strong recognition of the Irish Government’s focus on tourism, and its role in creating jobs and supporting incomes. I’m delighted to be here to talk about our tourism strategy including our efforts to promote new air and sea routes into Ireland, the special 9% VAT rate for tourism, the €0 air travel tax, and the long-awaited independence of Shannon Airport. It’s great to be able to promote our record in creating extra jobs in tourism and hospitality on the world stage,” Minister Varadkar said. Minister Varadkar is participating in two roundtable discussions at the WTTC, with a particular focus on air and sea connections, visa policies and taxation. Later this week, Minister Varadkar will join Tourism Ireland and the Irish Embassy at events in Shanghai and Beijing to further promote Ireland as a tourism destination in the lucrative Chinese market. Other meetings will focus on trade meetings, media promotions, developing new aviation links between China and Ireland, and the opening up of business opportunities for Irish airports and Aer Rianta International. ARI already has a business unit at Kunming Changshui International Airport in China, where the company has a concession for retail outlets. 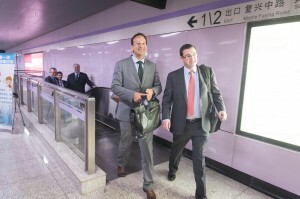 Minister Varadkar will also meet with representatives of the Irish Diaspora in China such as the GAA. “After the success of the Gathering Ireland 2013, I want to say a special thank you to our Diaspora who supported it so willingly and positively, including through local GAA clubs and other links to home,” he said.